Tehran, Iran (CNN) -- Saturday began with calm on the streets of Tehran but witnesses said scattered clashes erupted later in the evening between Iran's security forces and demonstrators gathering at key sites to mark the first anniversary of a contested presidential election. The first skirmishes Saturday were reported at about 6 p.m. as uniformed riot police and plain-clothes security forces, many on motorcycles, chased away growing crowds along the sidewalks of Tehran's Vali Asr Square, witnesses said. Witnesses told CNN they saw several people struck by batons as they were running away. They said at least five people were arrested, blindfolded, handcuffed and swept away by security officers, who also used tear gas to disperse the crowds. Due to government restrictions on the international media, CNN is unable to independently verify the information from the Iranian witnesses. A planned demonstration was called off earlier in the week by opposition leaders. Still, tensions began to rise Saturday around 4 p.m. when a large number of security forces, riot police and members of the Islamic government's voluntary Basij forces filed into major squares and intersections, including Vali Asr, Azadi Avenue, Azadi Square and Revolution Square, witnesses said. The disputed presidential election last year sparked widespread outrage within the Islamic republic and gave rise to the Green Movement, led by opposition candidates Mir Hossein Moussavi and Mehdi Karrubi. Large numbers of protesters took to the streets in defiance of the hard-line regime led by President Mahmoud Ahmadinejad. But the government cracked down on protesters and has steadily been tightening its grip throughout the year, according to human rights activists. Moussavi said in a statement Saturday that the opposition "will continue to insist on our positions and eventually the government will need to come to its senses because by insistence we keep people's objectives alive." In an e-mail to CNN Saturday, Karrubi said that though the situation for Iranians has not improved since the elections and subsequent demonstrations, "the Iranian society has made strides in the path of knowing their rights, and this is a great achievement." Karrubi also defended the loss of life of opposition protesters supporting the movement, saying "there is a heavy cost if you want to reform a system that's approaching corruption (and) ignoring the goals of the revolution, constitutional rights and the blood of our martyrs." He went on to say that the movement is "stronger and more mature than last year." "Despite a heavy climate of repression, this movement has been able to unite and spread to different layers of society," Karrubi said. Prior to Saturday's anniversary, it had been difficult to predict whether demonstrations would take place or how large-scale they would turn out to be. Fearing for people's safety, Moussavi and Karrubi canceled plans for demonstrations Saturday but some Iranians told CNN they still planned to venture out on the streets. "There is fear," said Azadeh, a 30-year-old bank teller in Tehran, who asked to be identified by an alias for fear of her safety. "I can't say I'm not scared, but you still have to go out -- because that's what the government wants, for you to be afraid and not continue. But we have to." 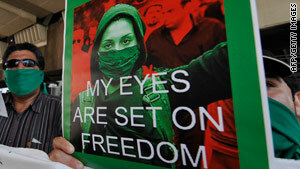 U.S. Secretary of State Hillary Clinton condemned the crackdown on protesters in a statement Saturday. "It is the responsibility of all free people and free nations to stand with peaceful reform movements seeking the rights that are our common birthright," she said. "The United States once again calls on the leaders of the Islamic Republic of Iran to meet their obligations to their own people and to the international community by respecting the rights and dignity of their citizens and by fully upholding Iran's international obligations," the statement said, calling on Iran to release imprisoned human rights activitists and three American hikers who have been detained in the country's notorious Evin prison since straying over the border in July. "The United States reaffirms its commitment to engage with Iran on all issues in pursuit of a negotiated diplomatic resolution, on the basis of mutual respect and mutual interests," the statement said, adding, "but we also will continue to speak out in defense of basic human liberties and in support of those around the world who seek to exercise their universal rights."